Dice eggs and potatoes in 1/5 in. / 1/2 cm cubes. Chop the anchovies, onions, chives and dill. Mix with the sour cream. Season with salt and pepper. Serve on good bread, edge-cut dark rye bread or crisp bread. 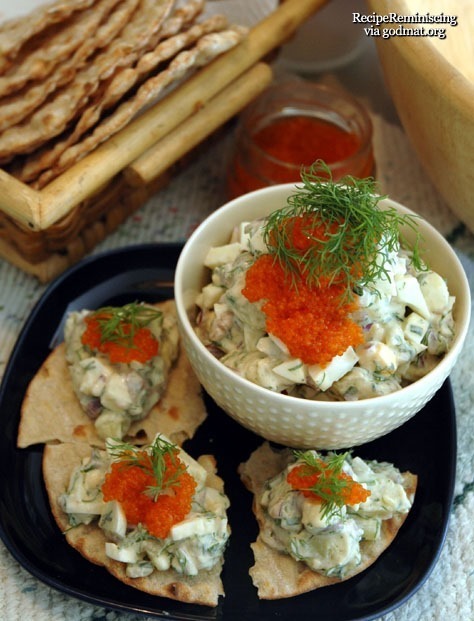 Garnish with large-grained caviar topped with a sprig of dill or some chopped chives.